The definitive pictorial of natural rock crystals, you will use this handsome, sewn-binding softcover many times over for starting or adding to your collections, cataloguing your finds, and for giving as gifts. 7 1/4x 6 3/4", it's easy to take along with you, too! In addition to large, clear photographs, we have written a glossary of proper names and descriptions, grading, and cleaning methods for your crystals, as well as showing a few of the items we make by hand to spark your own ideas. Know what a Dow really looks like [and how rare they are]? The difference between a curved crystal and a bent one? Gallery quality photography and clear descriptions will make the difference between your purchasing the real thing or someone else's mistake! 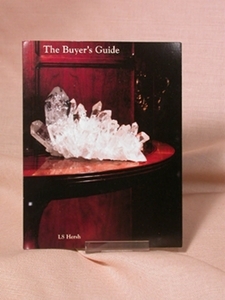 Termed "a worthwhile addition to any mineralogical library" by Lawrence H. Conklin [Larry, an icon in the mineral world in business since 1955, now deceased and missed]; this book is used and loved by children and adults alike. If you'd like your copy signed, please let us know how you would like the inscription to read. Sent gift boxed. Shipping will be added: domestic media mail within the US; first class internationally. We will refund any difference between these methods and UPS before your payment goes through.